Römerberg is the old centre of Frankfurt. 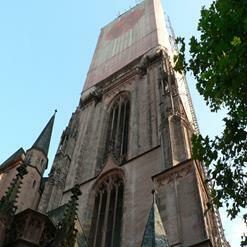 It features various buildings and a church from the 14th and 15th century (the buildings were mostly destroyed during World War II but completely rebuilt afterwards). The Römer itself is the town hall of Frankfurt. Cafe's and shops can be found at the square itself and in the vicinity.